We have being raising money for Sailors Society since 2006, however they became our nominated charity in 2008. Here are a few ways we have got involved. Our MD Dave took part in the Sailor Society’s 10KM London Run. Saliors Society becomes our nominated charity. In October Eddie took part in the Sailor Society’s Great South Run. In September three member of the team (Natlaie, Sarah and Tanya) ran the Adidas 5K in Hyde Park. The Canterbury office joined forces with Eaton Dorney and competed in the Sailors Society Dragon Boat Race. Dave and Dawn tackled Sailor Society’s Asian Challenge ‘Mount Kinabalu’ over the 8th – 11th Arpil. At 4095 meters Mount Kinabalu is the highest mountain in South East Asia. In August Eddie cycles Ride London 100 for Sailors Society. In June Heather abseiled 540ft down Broadgate Tower. 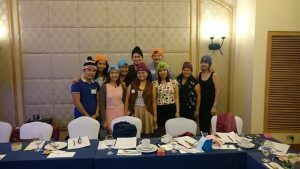 Our manila and Canterbury offices’ collected woolly hats for seafarers, who often come form hotter climates and warm hats are not available. June – Eddie, Heather and Natasha take on the three peaks, in just 24 hours. Climbing Ben Nevis, Scotland then on to Hellvelyn in the dark in the early hours in Cumbria and finally Snowden in Wales. The Sailors Society sustains a network of trained Chaplains, who work tirelessly to provide welfare and support for merchant seafarers and their families, around the World. Over 95% of the world’s trade is transported by sea, yet sea farers are often forgotten.